Do you know which water filter you need? If not, give us a call and we will help you identify the model no. of your fridge freezer and also which replacement water filter will fit. Great News! Hillmark Steel Kleen Stainless Steel Cleaner Spray is back in stock! Hurry While Stocks Last - Only £15.00 - Buy Now! Please note, if you wish to pay by American Express you will need to call us to take your order over the phone. Call 01276 489571. FridgeFiltersOnline.co.uk is our easy to use, secure and reliable online store. Enabling you to purchase quality, replacement fridge water filters for your American/American style, side-by-side fridge freezer, quickly, easily and at fantastic prices. Simply click on the manufacturer of your fridge freezer in the 'Product Sections' on the left, to find which replacement fridge water filter you are looking for. If you know the make and model number of the water filter you require, enter this information in the 'quick search' facility at the top of the page. 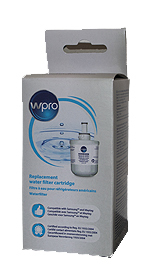 Every fridge water filter we sell is brand new and sealed in the manufacturer's packaging. We keep all fridge water filters in stock ready for immediate shipment. In addition to replacement fridge water filters we sell accessories such as stainless steel cleaners, Microban antibacterial filters, Affresh high efficiency washer cleaner, Glisten dishwasher cleaners and microfibre cleaning cloths. If you can't see what you need or if you have a question regarding any of the fridge water filters or other products on the site, then please feel free to contact us via email or telephone and we will do our utmost to help. Visit our partners, Liberty American Appliance Sales & Service, at www.maytagrepairs.co.uk. Liberty AA are a dedicated team of engineers specialising in Maytag, Amana and Admiral appliances.